Golf is supposed to be the gentleman's game - a game of etiquette and integrity where players enforce their own penalties and report their own scores and act with decorum while on the course. Like every part of the real world it can have its moments where that does not seem to be the case - the attitudes and actions of players and fans alike can be less than stellar. But in Phil Mickelson, recent Hall of Fame inductee, there is at least one man who is a true gentleman not only on the course but maybe even more so off the course. I am not a big golf fan. Not that I dislike it. But I only play it here and there, badly, and watch it really only on special occasions. I never latched onto any player until Tiger Woods came along, and only until he had his meltdown. Perhaps it was the minority against the establishment that made me root for him, but as we all know eventually Woods became yet another a textbook case of the spoiled athlete. However, one of my brothers is a big golf fan, and Phil - Lefty - is his favorite. Like me, neither of my brothers would be a fan of a 'bad guy' so I figured Phil was at least decent, and had heard here and there of some of his work off the course, but with becoming a Hall-of-Famer a great article was written about what he does over at Golf.com. Mickelson faced adversity when his son Evan was born and nearly lost both Evan and his mother, Phil's college sweetheart Amy, during the birthing process. Evan didn't breathe for the first 7 minutes, Amy ruptured an artery in her uterus during the delivery. Phil made a pact to do good things if they made it out. Good thing for us all they made it through and Phil was inspired to become the man he is, to lead a purposeful life, most of it in a quiet manner versus seeking the spotlight for his actions. "He does a lot of stuff I know nothing about," says Jim Mackay, his close friend and careerlong caddie. I highly recommend reading the Golf.com article which has in depth stories from people directly impacted by Mickelson. It is tough to get a handle on a guy like Phil, but just knowing that what we do know is only the tip of the iceberg with him can only garner a huge amount of respect. In fact, Mickelson is so well respected that PGA Tour commissioner Tim Finchem, who normally gives a brief "State of Golf", instead thanked Mickelson for being who he is. 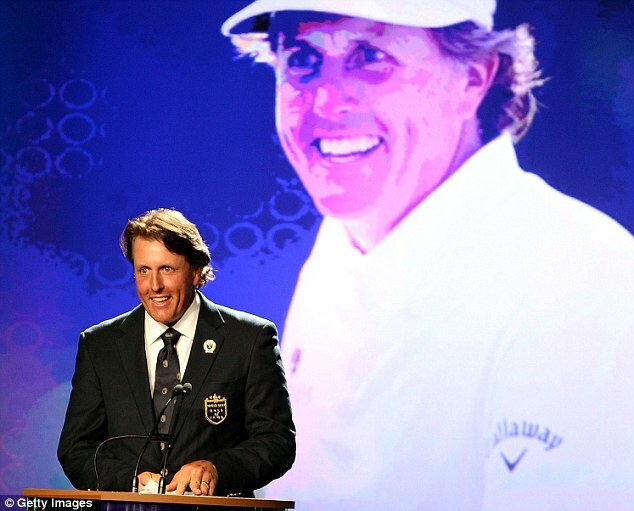 "I would like to thank him in addition for being a role model, a role model for young players coming up, and a role model for people who play the game of golf just for fun, because you've never seen Phil Mickelson on or off the golf course that he wasn't showing the proper professionalism that you want to see in any athlete, particularly an athlete in our sport," Finchem said. Great Play Lefty. Congratulations on your World Golf Hall of fame induction, and if there was a Hall-of-Fame for good guys, you would make it there as well.